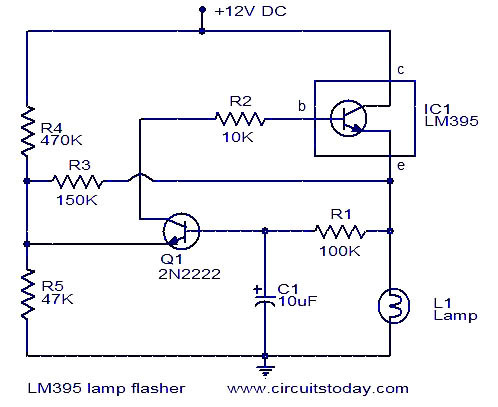 This powerful lamp flasher circuit is ideal for use in automobiles. The circuit is based on IC LM395 (also known as super transistor) which is a very powerful integrated monolithic power transistor with features such as thermal overload protection, current limiting etc. In fact this IC is almost indestructible.The IC can handle currents up to 1A and switch 40V in less than 500 nano seconds. Resistance R1 and capacitor C1 determines the frequency of flashing. With the stated values flash rate is around 1 flash per second. Lamp L1 can be a 12V, 1A one. An optional 1A fuse can be connected series to the positive supply line.